I guess I’ll get started with a list of what I WANT to do right now. 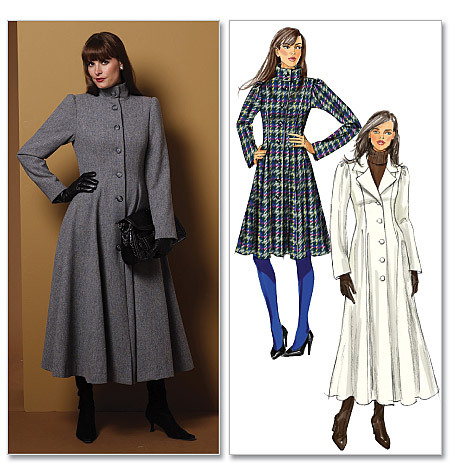 1) At Christmas I purchased a coat pattern, Butterick 5425. It’s a full-length, princess-seamed coat with collar variations (a classic lapel and a closed, round-neck), both of which I like. It’s fitted in the body and has a lovely full skirt. Just for background, I’ve been wearing full-length, wool coats since I first stole my mom’s old Hudson’s Bay coat back in highschool. And they all have two problems—they’re not quite warm enough (I live in Canada) and the sleeves are too short. Also, my current incarnation is on its last legs; the lining is giving way, as is the fashion fabric around the buttons. Ok, I am getting a little ahead of myself. While I would ultimately like to make the uber-winter version of this coat, there are a lot of steps to go first. A muslin, for one, to gauge the fit. Then probably a light-weight but fully-lined version, before I attempt to stuff one up with quilting batten for warmth. The pattern I bought only goes up to size 12, which is my size, but may be a bit snug depending on how much batten I stuff inside it. Also the sleeves have a bit of gather at the shoulder, which I’m not thrilled by; it shouldn’t be TOO complicated to shorten the sleeve cap to take it out, but I’ve never done it before. No doubt it will require a sleeve-length alteration (I have monkey arms), and possibly some tweaking around the midsection, although I’m hoping to avoid that. Which brings me to my big recurring fitting issues: the long arms are matched by long legs; (I know, I know, shut up already); although I’m 5’7″, my torso-length measurements are actually petite. On top of that I have a “boyish figure” (no breasts and hips, a wide waist), which means that my bust and hip measurements fall under the size-12 range, but my waist is firmly in the 14 zone. I’m hoping that won’t be an issue with a coat pattern, but it’s possible I’ll have to grade the outer shell up for my final version, especially if I want to put a heavy interlining in. 2) personal sloper: I’ve been reading a lot about how constructing your personal sloper can speed up making alterations, not to mention facilitating drafting your own patterns (something I’d REALLY like to do). This is something I really should move forward on before anything else… it could help me figure out at least some of my potential pitfalls for fitting (like sleeve length) BEFORE cutting out the muslin, which would be nice. 4)I also picked up a nice, U-necked, princess-seamed dress pattern at Value Village back at Christmas. I don’t have any fabric that’s crying out to me to make it, but it’s a lovely pattern (I had a dress very similar I used to love, except that… wait for it… the sleeves were too short). So that’s a possibility too, although the amount of fabric necessary for a dress seems unlikely to materialize for me in the near future. 5)Tops. It would be nice to find/buy/draft a nice top pattern or two, something I could really use in my daily wardrobe. And it wouldn’t take up as much fabric as dresses or long coats. I’ve looked at a bunch of patterns online, but most of my favourites are for knits only and knits scare me. I have a serger, but it’s in need of some TLC. Also finding nice knits is HARD. Ok, that’s enough blathering about plans… how about a little action?